You are at:Home»Things to do in Accra»London, New York Accra have you been to Carbon Night club? Are you looking for somewhere unique to go this weekend? If so we are guessing you have not experienced Carbon Night Club in Accra. This club brought to you by YoLo Experience and is perched in the penthouse of Icon house, high above the bustle of Airport City and Liberation Road. Billing itself as a luxury experience with ‘unexpected quirks and surprises. 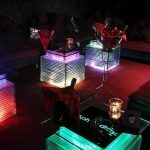 Located on the second-floor above the already popular Urban Grill, there is perhaps not much to distinguish Carbon Night Club from many other clubs in Accra. However, there is a generous dance floor and a VIP area, where bottles of champagne are shuttled across by a succession of easy on the eye waitresses. What makes this place special is the décor with the bank of windows looking out from its elevated position that takes in a city view of Liberation Road and Silver Star Tower.